Taste of Parsley has been a supplier to Westcon-Comstor for several years, but the prohibitive costs of hiring equipment to cater for larger events made it difficult to scale the business and explore their true potential. The Westcon-Comstor team handed over cutlery, crockery, glasses and necessary kitchen equipment to an unsuspecting and surprised Taste of Parsley team, who is now able to cater for up to 200 guests without having to hire catering equipment. Westcon-Comstor will also assist Taste of Parsley to live their vision of “where tasteful creations begin” by providing a series of corporate services such as marketing support that extends brand development, digital and social media campaign creation, advertising and social media skills transfer and support. 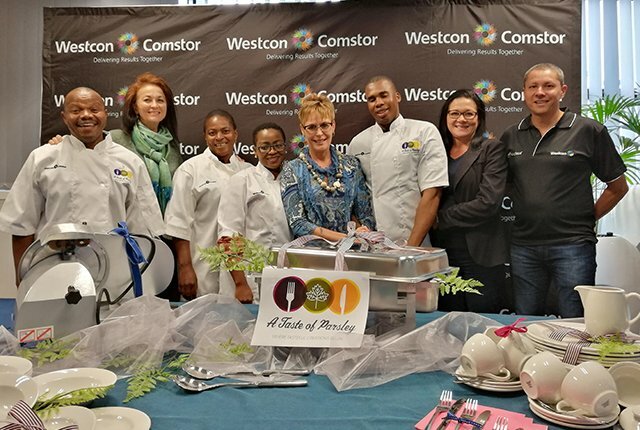 ‘’Our supplier development programme is geared to uplift small and micro enterprises to make a sustainable impact on their lives and the people they employ,” states Robyn Newel, Human Resources Director at Westcon-Comstor, Sub-Saharan Africa. “At Westcon-Comstor we pride ourselves as a Corporate Citizen by providing sustainable opportunities within our industry, communities and country at large. Small businesses in the services and IT sector are negatively affected by a shortage of skills and entrepreneurship capacity which act as constraints to business development, employment and overall growth. “Our learning and development programs are key components, with various initiatives running simultaneously, that contribute to the development of these businesses. Upskilling of the staff that make up Taste of Parsley will include entrepreneurship training, general office administration, accredited chef training from a culinary school and soft skills training. The greatest reward to us will be seeing suppliers like Taste of Parsley thrive and grow with our ongoing support where we can play a key role to unlock their true potential. At Weston-Comstor we take care of the future so that you can focus on the now ” ends Newel.